One of Kirsty’s recent initiatives is to establish her home town of Dunoon as a recognised WorldHost Destination. She has organised a preliminary meeting with the organisation and some local businesses with a view to kick-starting the programme. WorldHost customer service training has been used to train over 160,000 people in the UK and one million people worldwide. Becoming a WorldHost Recognised Destination means your town or city is recognised as providing a top-notch welcome to tourists and local visitors. 25 per cent of business in the area are trained to WorldHost standards, and they in turn train at least 50 per cent of their customer-facing staff. It’s an ambitious project but if anyone can get it up and running, it’s Kirsty Weir. Kirsty’s tireless efforts on behalf of her clients always reap very positive outcomes. 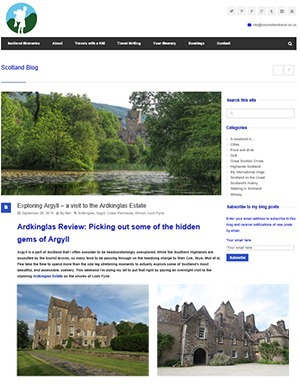 She has invited one of Scotland’s prestigious travel bloggers (from www.thescotlanders.com) to visit Ardkinglas House, (www.Ardkinglas.com) one of her clients. The blogger, who has 15,000 followers will stay in ‘The Butler’s Quarters at Ardkinglas (http://www.ardkinglas.com/self-catering-accommodation.html) The resulting blog will certainly further increase awareness of Ardkinglas House and result in even greater footfall and sales of accommodation. Kirsty gets a mention in the October edition of The Scots magazine. Kirsty organised a visit to the Cowal Peninsula for journalist Garry Fraser who was blown away both by the locale and by Kirsty’s knowledge and expertise. 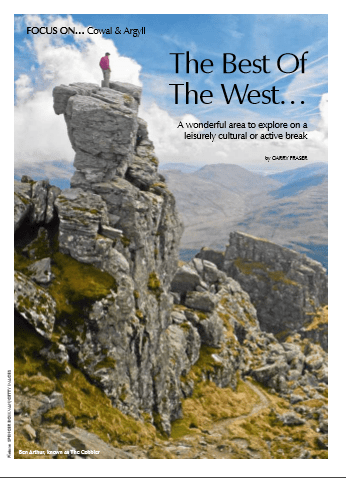 The magazine, which has a print run of 70,000, splashed the article over a seven page spread, featuring places to visit and stay. The magazine is read all over the world in, amongst other places, Canada, New Zealand and Australia, as well as of course the UK. Thanks to Kirsty’s input, one her clients – Ardkinglas House on the shores of Loch Fyne (www.Ardkinglas.com) – was featured in a very glowing account, along with another local attraction Quadmania. The article is so positive about the area, that it sure to tempt visitors to come to this lovely part of the world. Sweeney’s Cruises is one of the longest running family businesses in Scotland. It has operated boats on Loch Lomond since the 1880s, starting out with a fleet of steam launches and rowing boats. Over the years it has grown and now, in the ownership of the fourth generation of the family, it operates the most luxurious fleet of passenger boats in Scotland. To take their business to the next level and increase awareness of their brand within the travel market, Sweeney’s Cruises next challenge was to promote their services to a wider market. John Sweeney decided to outsource the task to a professional with valuable knowledge and experience in the tourism field and contacted Kirsty Weir Hospitality. Kirsty’s expertise and contacts within the industry are invaluable and she uses these to promote Sweeney’s Cruises services directly to the major decision makers in the tour industry, not only via email communications but also with direct face to face and telephone contact. Kirsty returns on a regular basis to devote herself to our business development project and seeks to continue with building awareness of our cruise business which greatly contributes to the steady growth of our sales. As a result of the commitment and efforts Kirsty has put in to driving our business development programme, the business has achieved a substantial increase in sales and greater awareness. Sweeneys’ Cruises has built many strong relationships with tour clients over the years, through Kirsty’s work and it is hoped this will be maintained for many years to come. Year-on-year the number of visitors the company attracts has grown considerably. To read the company’s feedback on Kirsty’s work for them, go to Testimonials. The present house at Ardkinglas was built in 1907 and is considered to be the architect Sir Robert Lorimer’s masterpiece. Although Ardkinglas House is not open to the public on a regular basis (it is still a private house), a private tour can be booked at any time of the year, and a public tour is available every Friday from April to October. The Woodland Gardens are open all the year round with views of the exterior of the House, with its scenic backdrop on Loch Fyne. The self-catering holiday apartment within Ardkinglas House – the original “Butlers Quarters” can be rented all the year round, with free access to the House Grounds and the Woodland Gardens. The venue is also used for special events, weddings, corporate hospitality and is available for hire throughout the year. It is also used as a film and television location. The next step for Ardkinglas was to increase their brand awareness within the tourism sector and generate business for their tours and self-catering accommodation, whilst at the same time positively marketing their corporate hospitality business. Arkinglas selected Kirsty Weir Hospitality because Kirsty could over the dedication to their business on an ongoing business. She had the knowledge, professionalism and contacts within the sector to be able to drive their PR and marketing strategy forward in exactly the way Ardkinglas needed. Kirsty immediately rose to the challenge and put in place a programme of targeted emails to relevant companies, following up sales and marketing leads that Ardkinglas had and used her contacts to facilitate presentations to Visit Scotland. Kirsty was tenacious and worked hard at getting to the people that matter. As Kirsty Weir Hospitality has been working with Ardkinglas House for less than a year, it is too soon for financial results to be available. However, Estate Manager, Jean Maskell reports that they are delighted with the extensive publicity Kirsty has generated for them. Again, Kirsty’s prevalent contact base is mentioned as being a tremendous asset in promoting Ardkinglas House. Jean Maskell says: “Kirsty has generated a great many leads in a comparatively short space of time. She has integrated our different tourism streams into a coherent PR strategy. We have definitely seen results in terms of increased footfall and accommodation sales. Loch Lomond Shores is a visitor destination, which combines a spectacular location on the shores of Loch Lomond with a mixture of leisure and shopping experiences. It is open all year round daily from 10am. The Loch Lomond Shores Management Company needed to promote the launch of the visitor destination to the public and enlisted Kirsty Weir Hospitality to help them with this challenge. Kirsty helped prepare a marketing strategy for the launch of the visitor destination including the development of branded merchandise and the creation of links with travel trade intermediaries and local hospitality industry suppliers. A targeted marketing programme and various promotion strategies were put in place leading up to the launch. Loch Lomond Shores hosted a spectacular debut event which gained widespread press and broadcast media coverage and saw Loch Lomond Shores quickly become established as a successful visitor attraction. In year one Loch Lomond Shores attracted over 2 million visitors, including 275,000 to the main visitor attraction. The development is now a successful year round destination that attracts a broad mix of tourists, day visitors and families from across west and central Scotland. Chief Executive of Scottish Enterprise Dunbartonshire, David Anderson, said Kirsty played an important role in developing the marketing strategy and approach at the inception of Loch Lomond Shores enabling the development to get off to an excellent start. "Kirsty has been a superb asset to Sweeney's Cruises - Loch Lomond for 8 years now, succeeding in bringing substantial additional business for us on Loch Lomond. She's a truly outstanding communicator and genuine people person with a special ability to win new clients and raise and maintain a high profile in the right places. Kirsty brings her passion for people, tourism and marketing to bear on all she does and nothing is too much trouble. We would recommend Kirsty as somebody equipped to help promote all types of tourism business and who can provide excellent marketing strategies tailored specifically to individual need that reap real rewards." Now it’s even easier to cruise Loch Lomond – thanks to Kirsty Weir! Kirsty Weir is world-class – it’s official! Copyright © 2019 Kirsty Weir Hospitality. Powered by WordPress. Theme: Accelerate by ThemeGrill.